In 1963 the waters began rising behind Glen Canyon Dam and 170 miles of the Colorado River slowly disappeared as the riverbed and surrounding canyons filled with water. 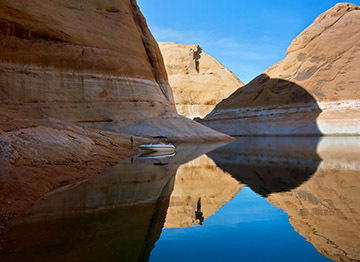 Environmentalists considered it a disaster and mourned Glen Canyon as gone forever. The Sierra Club joined forces with photographer Eliot Porter to document what would be lost under the dam’s waters, resulting in the publication of the landmark 1963 photobook The Place No One Knew: Glen Canyon on the Colorado. But in an unexpected victory that speaks to the pervasive disaster of climate change, the reservoir is now declining and the Colorado River is coming back. Photographers Byron Wolfe (born 1967) and Mark Klett (born 1952), along with writer Rebecca Solnit (born 1961), spent five years exploring the place as expectations and possibilities changed, and the river reemerged at the upper end of the reservoir. Join us for the exhibition opening from 6 - 8 pm, with opening remarks by Louise Lamphere, Distinguished Professor of Anthropology and Subhankar Banerjee, Professor, Art and Ecology and Chair of Land Arts of the American West.